Easter in Italy is probably one of the most important holidays with numerous customs and celebrations. Let’s have look at the typical religious and cultural customs and see how you can celebrate Easter like in Italy. Like all holidays in Italy, Easter, or Pasqua in Italian, has its rituals and traditions. The Monday following Easter, la Pasquetta is also a holiday throughout Italy. Usually during the days before Easter many solemn religious processions are held in lots of towns and they typically take place on the Friday and Saturday before Easter. Special statues of the Virgin and Jesus play a big part in these processions, they can be paraded through the city or displayed in main squares. As usual parade participants are dressed with traditional ancient costumes. A famous emblem of Italian Easter is olive branches, used instead of, or along with, palm fronds in the processions and to decorate churches. Enna, in Sicily, has a huge procession on Good Friday, with more than 2000 friars dressed in ancient costumes walking throughout the city. Trapani, also in Sicily, is a good place to see processions held several days during Holy Week. Their Good Friday procession, Misteri di Trapani, lasts 24 hours! These processions are dramatic and spectacular. 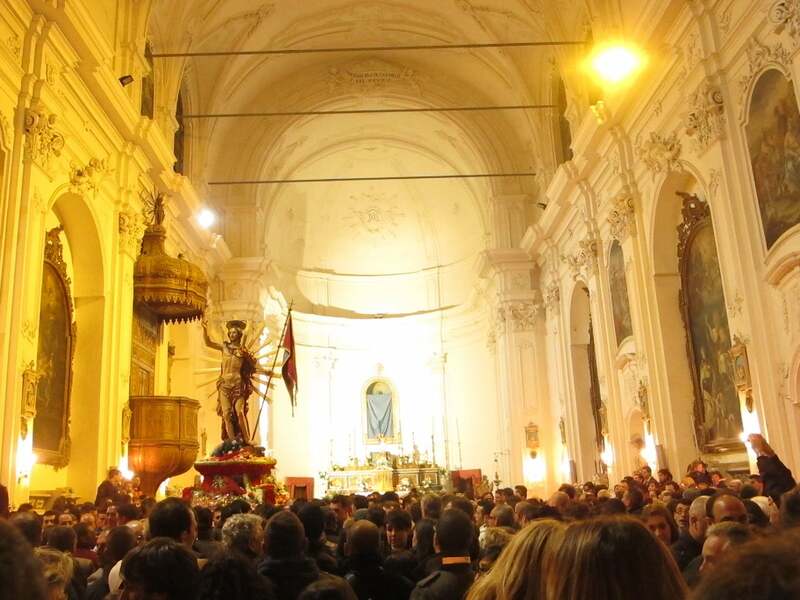 Some towns, such as Montefalco and Gualdo Tadino in Umbria, hold live scenarios during the night of Good Friday or plays enacting the stations of the cross. For sure, the biggest and most popular mass is held by the Pope at St. Peter’s Basilica. On Good Friday, the Pope celebrates the Via Crucis, or Stations of the Cross in Rome near the Colosseum. A huge cross with burning torches lights the night as well as the stations of the cross are described in several languages. At the end, the Pope gives a blessing. Another very famous Easter event is the Explosion of the Cart (Scoppio del Carro), in Florence. If you are lucky enough to be in Tuscany during Easter, you will be able to see some of the most beautiful traditions. A huge and decorated wagon is dragged through Florence by white oxen until it reaches Basilica di Santa Maria del Fiore in Florence’s historic centre. Following mass, the Archbishop throws a dove-shaped rocket into the cart, igniting the fireworks held in the cart. This spectacular display is followed by a parade in medieval costumes. In regards to typical dishes, of course in Italy there’s a range of some characteristic Easter foods, including first courses, second courses and desserts. Give our Easter Recipe for Traditional Italian Roasted Lamb with Potatoes a go!